What about raising the bar on the potential of offshore wind power? Growing out a concept and a drawing on a napkin have turned into big floating wind turbines off the coast of Scotland. They are making news headlines and are giving energy watchers a lot to think about. The turbines were tethered to the seabed about 15 miles from Peterhead in Aberdeenshire, said the BBC. This is the Hywind Scotland Pilot Park, a park configuration of five 6 MW turbines with a total installed capacity of 30 MW and a transmission voltage of 33 kV. "The 30 MW Hywind Scotland pilot park will demonstrate the feasibility of future commercial floating wind farms that could be more than four times the size. This will further increase the global market potential for offshore wind energy," Norwegian energy firm Statoil said. The operation to tow the turbines into place was completed in August. The wind turbines are out at sea and are producing electricity, said reports. The project is operated by Statoil in partnership with Masdar. Partner Masdar will install Batwind, described in the Statoil announcement as a 1MWh lithium battery storage solution for offshore wind energy. "The floating approach allows turbines to be installed in much deeper waters than conventional offshore wind farms," said the BBC. "This wind farm is positioned in water depths of up to 129m, whereas those fixed to the seabed are generally at depths of up to 50m." Then what is so special about a floating wind farm? The Engineer last year ran an article on floating wind turbines. Helen Knight wrote that "In Europe, over half of the North Sea is considered suitable for floating wind farms, with water depths of between 50m and 220m. The European Wind Energy Association estimates that energy from turbines at depths of over 50m in the North Sea could meet the EU's electricity needs four times over." The project will generate enough power for about 20,000 homes, said a video caption on the BBC report. Reader reactions on sites carrying the news ranged from those who anger easily when hearing news of wind energy projects to those who are excited about the possibilities. One reader thought the concept nutty, another regretted that oceans are not left alone and clear, some regretted the initiative as expensive, another worried about the effect on birds while others called the work accomplished as awesome and majestic. In fact, the Statoil company announcement addressed the issue of cost head-on. "In recent years, there have been significant cost reductions in both the onshore and bottom fixed offshore wind sectors. 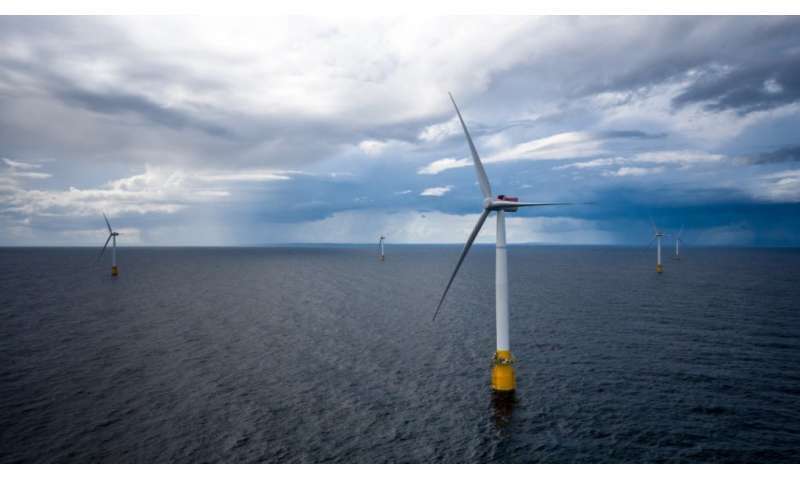 Floating wind is expected to follow a similar downward trajectory over the next decade, making it cost competitive with other renewable energy sources." Tom Delay, CEO, The Carbon Trust, quoted in The Engineer, said it was "crucial that innovation continues to drive down costs and the right policy is in place to increase investment." Thank you Statoil, well done and good luck to all involved with the Hywind Scotland floating wind farm project. The map also shows the site for my proposed world's biggest ever pumped-storage hydro scheme at Strathdearn, near Inverness in the Scottish Highlands. I have described methods for integrating wind farms into the electricity grid so as to provide power on demand whatever the weather. As you will see my Wind Generation Capacity Focus Table (for 30MW Wind power) recommends the usual energy storage equal to 5 hours times wind power capacity or about 150 MWh (one hundred and fifty times more than Statoil's ridiculously small and ineffective "1MWh Batwind battery" plan). * World's biggest-ever pumped-storage hydro-scheme, for Scotland? The bottom-fixed variety has now a new option with the 'suction cup' anchoring variant. Prices for off shore wind are steadily falling (and are already being taken up by energy companies without any subsidies). Scotland should be well suited to become a huge energy exporter. Wind is practically one of the main natural resources. Fortify Them with Electric Battery Charging Task and Helicopters-Drones Combo Accessories ! When a Hurricane Hits, They should Just Tumble a couple of times, get pushed a distance and Again Get Back To Work ASAP ! LITTER THE OCEANS With Floating Turbines ASAP, Please! Fish & Whales will Love the New Companions. WHO CARES ? I can imagine seeing a network of these all along the California coast as instead of oil platforms, there will be platforms that will use the electricity to make Hydrogen from the sea water. "there will be platforms that will use the electricity to make Hydrogen from the sea water." How do you de-salinate the seawater? How much energy would that take? Otherwise you get chlorine gas out of the electrolysis, since the water contains sodium chloride, and that's a bit nasty for both the equipment and the environment. That's generally the difficulty with making hydrogen out of any water, since all naturally occurring water sources contain dissolved minerals which get concentrated, scale up and foul the electrolysis cells and membranes as the H2O is removed. Even rain water contains impurities like dust that are washed down from the sky. There's an enormous energy expense in purifying the water stock needed to make hydrogen, which is why it's generally made by splitting natural gas (CH4) instead. How do you de-salinate the seawater? You don't. Use an electrolyte more concentrated than sea water so water diffuses from the sea through a membrane; fouling / piercing from sea life an issue. Alternatively, use filtered rainwater from surface. "Off-Shore Electricity from Wind, Solar and Hydrogen Power"
"The diagram shows how hydrogen gas can be used to store energy from renewable-energy platforms floating at sea by sending any surplus wind and solar electrical power down a sub-sea cable to power underwater high-pressure electrolysis to make compressed hydrogen to store in underwater inflatable gas-bags. It's potentially very cheap because no super-strong pressure containment vessels are required - the ambient hydrostatic pressure which is proportional to depth serves to compress the hydrogen gas to containable densities." "to compress the hydrogen gas to containable densities." Just build a couple of thousand 1000 megawatt fission plants. No need to store hydrogen as you can flash up as much as you might ever need, on the spot, you might say. FISH EAT EACH OTHER ! We Don't want them to get there. COLLECT DAILY & SELL To Restaurants ! "It's potentially very cheap because no super-strong pressure containment vessels are required - the ambient hydrostatic pressure which is proportional to depth serves to compress the hydrogen gas to containable densities."" You forgot to account for the buoyancy of the compressed hydrogen. A cubic meter of it lifts nearly a ton, so you need some strong gas bladders or they'll rip apart, and rip off their moorings as well.